"Microchipping can be a life saver. and pet ID tag on your cat." So what exactly is microchipping? "Microchips" are small computer chips about the size of a rice grain. A veterinarian injects the chip under your cat's skin. Most cats tolerate this minor procedure with no problem. The chip contains your cat's identifying information and can be read by a special scanner. If your cat gets lost and is taken to an animal shelter, most shelters can scan the information on the chip, identify your cat, and get her home to you. Having your cat microchipped is a good way to help her get home if she ever becomes lost. Having your cat microchipped is an added security measure to make sure that your lost cat finds her way home. However, this should not be the only form of ID your cat has. A safety collar and identification tag should also be worn by your cat at all times. Having a safety collar with a current ID tag will help you and your cat if she is found in an area where the local shelter is not equipped with scanners. It also helps to prevent your cat from being taken to the shelter in the first place. If someone finds your cat and simply reads the information on the cat ID tag, they can just contact you directly and help your lost cat get home even quicker. Even better is an all-in-one collar cat ID collar, which can be found online at Amazon. 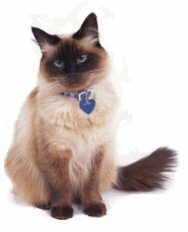 However, if your cat becomes lost and loses her collar, a microchip is often a powerful back-up method to help your cat get home quickly and safely. The cost to microchip your cat at your local veterinarian is usually under $50USD. There is an additional minor fee to register your cat's chip ID number. This additional fee ensures that your cat's identification and your contact information are registered with as many shelters as possible, including those outside of your local area. Some animal shelters automatically 'chip their animals for adoption. If you adopt your cat from such a shelter, you usually only have to pay the small registration fee. Local shelters often offer special rates to their communities. In my area, they even have certain times of the year where they will do the procedure on cats and dogs for free. Call your local animal shelter to ask if they have this service available. Microchipping and/or scanning is not available in all areas. It's especially important in these areas that your cat wear a safety collar with a pet ID tag. And remember, just because your local animal shelter offers microchipping and microchip scanning, if your cat gets lost in an area that does not have scanning available, a safety collar and ID tag will be her only chance of making it back home to you. Important Note: Some pet hospitals, such as Banfield, use microchips that cannot be easily scanned by most shelters. Be sure to ask not only the pet hospital microchipping your cat, but shelters as well, to make sure your cat is being microchipped with the best microchip. Please read the important related article about the Banfield microchip. Banfield Microchip Warning - Check out this warning about the Banfield Microchip.